As we switch from season to season we're lucky in the Midwest to have four distinct seasons. 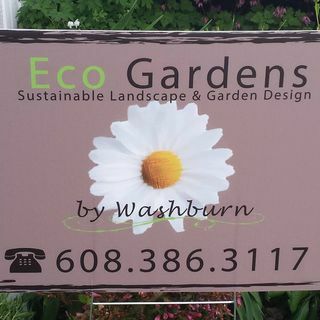 What does eco gardens by Washburn do in the winter months. Well in the winter months garden design is so sustainable landscape design. Getting ready for spring eco garden will also come out and do them like fruit tree pruning. No we're just gearing up and we're going to educational seminars trade shows getting ready to see what new things are coming out the next season. Plus there's ... Más informaciones always new diseases new pets that we have to learn about to watch for and how to combat them sharpening up the tools and making sure everything's ready to go for the next season as well. I had the opportunity to walk through a garden with you and I thought that was really cool. Do you offer that as a service where you'll take somebody through and show them things in their yard that you could do this and this is what this plant does and here's why this one would be good for your backyard. Yes absolutely. There's many people that call me just to come over for ideas so I go over and provide a consultation. And you know even with scheduling like OK Thero and when should I do this. When should a true that when should they fertilize everything calendar based when it comes to dealing with your garden. No no I wouldn't say calendar based I would say temperature based. You know we look at the life of the plant or the lifespan of the plant really the temperature makes the big difference. We're known as the frozen tundra or at least the area of the frozen tundra. When it comes to when the ground freezes and we end up with her Snow is there anything that we can do or what should absolutely be done before our first snow flies Hulsey Lottering. You don't need to fertilize things because they're going into dormancy. Well not evergreen. You could give a little shot of the light there right now definitely watering that in giving them a very very healthy drink. They need that energy to get down to their roots so that they can survive the winter because we're not probably going to get a whole lot of rain. Maybe we will in the winter as long as your larger plantings get a really healthy drink. Then you can start to say yep I did the best that I could to prepare these plants for winter. A lot of the big box stores sell bags of mulch is that the kind of mulch that you're talking about and you're talking about mulching. You can certainly use that but also press clippings and leave would work just fine. And if you have a straw bale around as long as these scenes are disease free and don't have a bunch of mold I'd say use them. And yet you could definitely use like a cedar molds if you like from the big box stores. No problem when it comes to my asparagus do I cut those down or do I do a lot those winter and then come down in the spring. Essentially you could do either one Bob. But if you wanna cut them down right now you certainly can. I'd probably cut to about 4 inches above soil level. What about strawberries do I need to do anything with those. Give him a good mulch. Get yourself a straw. Clubroom with and look best to be. Do I want to cut him down at all or just put it right over the top of the leaves and everything I just put it right on top of them because they're going to those they're going to die anyway. When you start raking that stuff off in the spring it'll come right with it.